Posted by M Bharath Bhushan in Andhra, Mulki, Settler, Telangana. 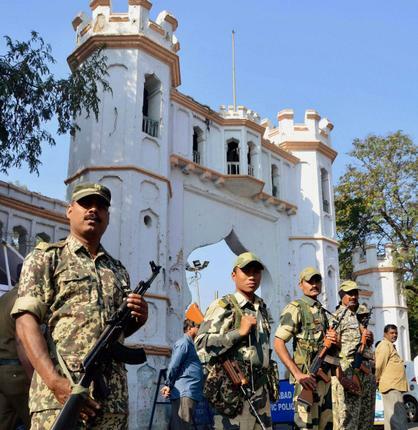 Hyderabad Even as the opponents of Telangana state were trying their best to delay the process, the state’s official machinery seems to have got down to the exercise of bifurcation. While the Chief Minister N. Kiran Kumar Reddy called on the President Pranab Mukherji at Rashtrapati Nilayam in Hyderabad and reportedly pleaded with him to keep Andhra Pradesh united, the state bureaucracy was busy collecting the necessary data including the details of assets, liabilities and workforce from different departments and the public sector undertakings. In a significant move the General Administration Department has also issued instructions to the employees to provide details of their birth place, date of joining and pay scale, among other things. It is understood that the services of the government employees will be allocated to the state where they were born. Posted by M Bharath Bhushan in Andhra, Culture, heritage, Hyderabad, Identity, Kakatiya, Rayalaseema, Telangana, Telugu, Telugu (తెలుగు), Warangal. Hyderabad: Literature is an important tool to craft the identity of a populace. Each state in India and regions within have their own distinct identity. The same holds true for Andhra Pradesh. With three definitive regions and 23 districts, the undivided state is a garden of literary flowers. But once imaginary borders divide the current state into Telangana and Andhra Pradesh, what does fate hold for Telugu literature? Writers reckon the separation will herald better times for Telugu literature and put focus on the unique literature and unsung writers of Telangana. It has been said that the literature and history of Telangana has been suppressed under the cloak of a united Telugu state for long and has often been dismissed as slang. Freedom struggles of farmers and common men from the region often don’t find a mention in the regular curriculum. From the Telangana writers’ perspective, their literature was never treated at par with the mainstream Telugu literature. “Telangana has recorded several struggles that are recognised, but they never found their place in the chapters of history. Andhra’s history became the whole undivided state’s history,” award winning writer Prof. Nandini Sidda Reddy explains. Posted by M Bharath Bhushan in Hyderabad, Mulki, regionalism, Settler, Telangana. Hyderabad: The Telangana judiciary will face a huge staff crunch after bifurcation because of the historically lower recruitment in the region. According to the bifurcation Bill, the strength of the Telangana and the residuary state judiciary will be finalised based on population. This means the Telangana judiciary will get 42 per cent of the total jobs. Posted by M Bharath Bhushan in Andhra, Bhadrachalam, Congress, corruption, drama, Godavari, Identity, Koya, Polavaram, politics, ST, Telangana, Y S Jagan. Till the other day he had been a staunch integrationist and hero in the eyes of those agitating in Seemandhra region opposing the bifurcation of Andhra Pradesh. But, Today, he seems to have become a ‘zero’ in their eyes when he let loose his ‘tongue’ in a fit of rage. The downfall of Union minister Kavuri Sambasiva Rao from being a hero to a zero in the eyes of those fighting for Samaikyandra was scripted at Chintalapudi town in West Godavari district on Tuesday. Posted by M Bharath Bhushan in BJP, Congress, drama, politics, Rayalaseema, TDP, Telangana, Y S Jagan. Hyderabad: The Business Advisory Committee of the state Assembly was able to conduct its business peacefully and without too many heated arguments on Tuesday thanks to the direct support of Chief Minister N. Kiran Kumar Reddy, who attended the meeting, and the indirect support of Leader of the Opposition N. Chandrababu Naidu, who did not attend the meeting. The BAC, which sets the schedule to be followed in the Assembly, decided to complete the discussion on the Telangana Bill in three phases. In the first phase, the discussions will be held from December 18 to 20. The second phase will start from January 3, 2014, and the third phase will start from January 16 and be completed by January 23, the deadline given by President Pranab Mukherjee. The BAC meeting was held under the chairmanship of Assembly Speaker Nadendla Manohar. In the BAC meeting, Kiran Kumar Reddy and finance minister Anam Ramnarayana Reddy proposed that the Assembly be adjourned after the discussion on the Telangana draft Bill starts on Wednesday, and reassemble on January 2 to take up discussion on the Bill. Posted by M Bharath Bhushan in Andhra, Andhrapreneurship, BJP, Congress, corruption, drama, elections, Hyderabad, Identity, MIM, Mulki, Muslim, Polavaram, Rayalaseema, Reddy, regionalism, Settler, TDP, Telangana, TRS, Y S Jagan. Telangana is now close to statehood on the strength of an untiring, intense mass struggle that had its basis in the assertion of historical political identities. To allow electoral calculations to decide the contours of the new state is to undermine the legitimacy of the aspirations that fuelled the original demand for statehood. Nothing but sheer political opportunism explains the new proposal to enlarge the proposed state by adding two districts of the Rayalaseema region, Kurnool and Anantapur, to create what in popular parlance has come to be known as Rayala-Telangana. This idea that has sprung out of cynical political calculations is ill-conceived, militating as it does against considered rationale for state formation. The proposal for Telangana in its original form includes only ten districts of Andhra Pradesh. That there is no popular underpinning for this concept either from the Telangana movement or the two districts shows that it is a politically-driven calculation. To think such a forced political union could solve some of the difficulties in sharing water resources post-bifurcation is naïve. If anything, the merger would add to the existing difficulties arising out of the bifurcation.